The small poodle was old, blind and obviously miserable. Euthanasia would be a gift in this case. I nudged my assistant, Dave to move on with me. "Try not to look," I said, resignedly. I did not note the forlorn pooch's ID number on the short list of dogs our organization, New Yorkers for Companion Animals, was able to "pull" from the heavily burdened animal control shelter which, too often is the final drop-off place for young, senior and neglected/abused animals no longer wanted by their guardians, or strays picked up from various parts of the city. Tried though I did, I could not nevertheless get the sad and pathetic poodle out of my mind. After all the neglect and/or abuse at human hands, should this little sad dog with his head down in the cage, not deserve something better than mere disposal from human culture? Was humane death the best and all we could offer now? What about life, love and care for this needy little dog? Was it still possible? I honestly did not know. I later went back to take a second look at the filthy poodle with mats so thick and hard they felt like rocks and black holes to which his eyes had sunken into. I noted his indicated age as only three years. He came to the front of the cage with seeming joy that someone was interested in him! I petted his blackened head and that was "it" for me. I wrote down the number, 534796 on a small post-a-note and gave this to one of the NYCACC staffers working, Rescue. I was told NYCACC would neuter and vaccinate him on Tuesday and I could pick him up on Wednesday. When I later told Dave, my assistant of my decision he looked surprised, but at the same time gratified. Yes, for some animals we can try to create a Christmas! I picked up the dog we would later name, "Lammy" from the NYCACC on a rainy Wednesday evening, a week or so before Christmas. A NYCACC volunteer was thrilled to see the little wretched, blind dog going out to rescue. "Oh, he's so nice," she said. "I am glad you are taking him!" I called a car service and told the driver to take me to "Run Spot Run," an animal boarding/doggie day care, facility on the Upper East Side of Manhattan. When I exited the cab at 91st St and York Ave with the filthy, dilapidated dog, two people stared and recoiled in horror upon seeing him. "Is THAT your dog?" one woman asked me in disbelief. I asked Carlos at Run Spot Run to arrange grooming for "Eddie" (a hastily made up name) at "A Cut Above" as soon as possible. He assured me it would be done the next day. I then signed the poodle in for grooming and boarding and took a picture of him before a dog handler took him away. 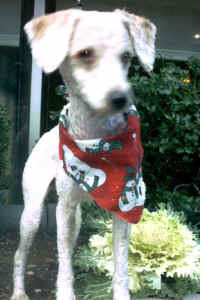 That night I sent out an urgent email to rescue lists seeking foster or placement for the poodle. Sara Whelen, Director of "Pets Alive," a no-kill shelter in upstate NY, was the only one to respond. "We will take him if you can't find anything," she assured me. I felt grateful for Sara's offer as I know how overburdened all no-kill shelters are. Nevertheless, I quickly accepted the offer as I felt it unlikely we could find a quick home for a blind, "imperfect" poodle. I was running short on dog boarding funds and foster resources. The next day, a young woman called offering to foster a dog. I told her about the blind poodle. Randi agreed to see him that night. Meanwhile, Lammy stood on his back legs doing a little "poodle dance" in seeming recognition and appreciation that someone was taking him home! I emailed Sara later to tell her the happy news and thanked her once again for her kind offer. Yesterday, I went to see Lammy in his new foster home and took some new pictures. Randi tells me he is "wonderful." "So cuddly and sweet. He sleeps in the bed. Follows me around and is almost getting the housebreaking down!" Although Lammy cannot see anything, he uses his other acute senses to relate to the world around him. He is an extremely intelligent dog with an abundance of love and faith in people and life. Yes, Lammy bumps into things, but not to be deterred from his curiosity and joie de vivre, he just picks his head up and moves on. He slowly navigates his way up stairs and is even trying to figure out going down stairs. Randi lives in a fifth floor walkup and has to carry Lammy down stairs. But, she was thrilled to tell me, "He walked down the stoop steps today!" 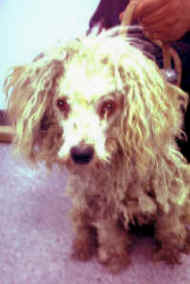 How long will it take to find this once horribly neglected and now blind poodle a loving and permanent home? Who knows? People usually seek the "perfect" dog, and Lammy with his bumps and occasional stumbles, is not "perfect." But, so far this Christmas has provided him with one miracle in the form of the many people who have come to Lammy's aid, rescue and cleanup. From the caring staffers at the NYCACC, to the facilities at Run Spot Run, to the talented groomers at "A Cut Above," to dedicated volunteers, like Dave Ambrosio, to the kind offer of Sara Whelen to take this handicapped dog, to the compassionate offer of Randi Robinson to foster-care him. Perhaps it is not too unrealistic to hope for the added miracle of a permanent, loving home? I am taking a lesson from Lammy: If this blind and once-neglected dog can still love, and have faith in people, despite our past failings, so can I. We humans can learn a few things from dogs like Lammy. One of them being, that even in the darkness, there can be light. New Yorkers for Companion Animals.